Reinvention and continuity – OOMPH! have been synonymous with self-renewal, pioneer spirit and carefree creativity for almost three decades. The Germans have been raised on EBM, rock and new wave, accidentally started a new subgenre in the 90s (the so-called Neue Deutsche Härte that influenced Rammstein and many more) and were crossover when crossover wasn`t even born. 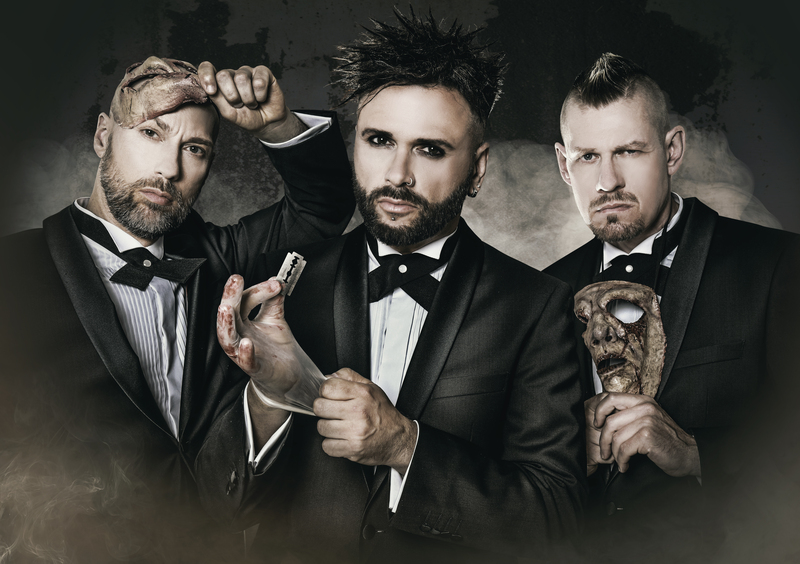 Many years later legions of fans with varied musical backgrounds are hooked and the band is no stranger to the highest chart positions – Dero, Flux and Crap were awarded their first platinum record for Wahrheit oder Pflicht in 2018. The trio is now ready to release its thirteenth longplayer Ritual that is poised to catch the listener offguard, „Our most aggressive, heaviest and darkest album in a while“, singer Dero states truthfully. The fuming and pounding triumvirate ‘Tausend Mann und ein Befehl‘, ‘Achtung! Achtung!‘ and ‘Kein Liebeslied‘ delivers the goods in stomping old school fashion, but after a breathless start it`s time for the über-catchy ‘Europa‘ (feat. Chris Harms / Lord Of The Lost) and the dancefloor monster ‘Im Namen des Vaters‘. Batshit insane electro tune ‘TRRR – FCKN – HTLR‘ curiously marks the only tongue-in-cheek entry on the otherwise rather stern Ritual that tackles politics, war and abuse. Eloquent, controversial, erratic and inescapable – OOMPH! came up with a stunning and mature masterpiece that makes peace with the band`s past and sets new impulses.